← Chamilia Special Offer! Free Bead with $150 purchase! Satterfield’s Jewelry Warehouse is praying for a revival to start in our country and everyone is invited! 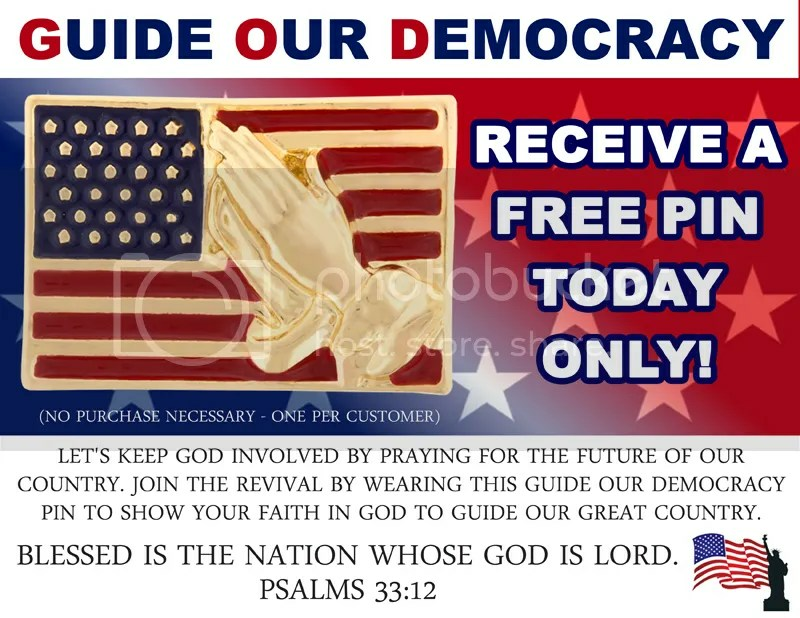 TODAY ONLY, Feb. 20, come in to one of our 3 locations and get a free American flag lapel pin with praying hands. We are calling it “Guide Our Democracy” and it is intended to cross party lines. It’s not about Republicans or Democrats or Independents – it’s about getting GOD involved in our country again. This entry was posted in Free Jewelry, Jewelry, Jewelry News, Jewelry Promotions and tagged 2015 primaries, 2016 election, american flag, american flag pin, guide our democracy. Bookmark the permalink.